VATICAN CITY (CNS) — Treated to music, dance and songs reflecting a unique mix of cultures and languages, Pope Francis called for greater respect, integration and care of Gypsy communities. “The time has come for uprooting centuries-old prejudices, preconceptions and mutual distrust that often are the basis for discrimination, racism, and xenophobia,” he said. It is time to “turn a new page” and end the indifference, neglect and hostility toward cultures and people who are different, he said Oct. 26 in an audience with more than 7,000 people taking part in an international pilgrimage of Roma, Sinti, Irish Travelers and other itinerant communities. The pilgrimage, running from Oct. 23-26, was promoted by the Pontifical Council for Migrants and Travelers, the Italian Bishops’ Conference, the Diocese of Rome and the lay Community of Sant’Egidio. During the audience in the Vatican’s Paul VI hall, musicians played traditional songs that also reflected the various influences of the native cultures of the lands they live in like, Spain, Ireland and Eastern Europe. 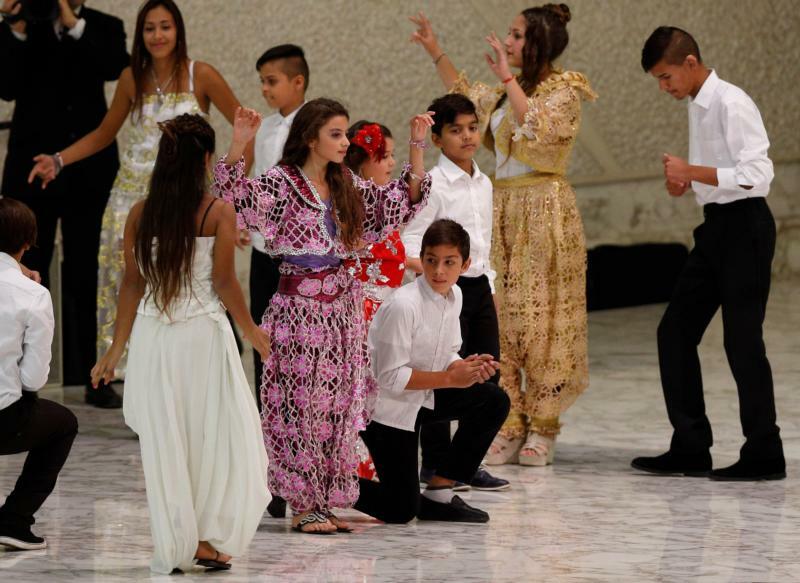 A group of young Muslim girls and boys danced in colorful dress for the pope to music reminiscent of the Orient. While praising the progress made since that historic moment in evangelization, new vocations and social development in Gypsy communities, Pope Francis recognized the continued difficulties, misunderstandings and challenges facing many of them. They, like all people, have the right to dignified living conditions and employment, an education and health care, he said. He also urged families to encourage their children to get an adequate education and demand from public authorities, when needed, their kids’ right to sign up for school. Education contributes to the “healthy development” of the person and gives them the needed skills to enter the work world, he said.